Police, Lawmakers Fight Opioid Crisis in N.H. The heroin epidemic is getting worse in Manchester, New Hampshire. In September alone, 100 people overdosed, and nine people died from using heroin. Manchester Police Chief Nick Willard says the only way to fight this epidemic is to put all hands on deck. "If you're a law enforcement officer - any color, whether you;re green, brown or blue, I'd be more than happy to put you to work in my city," said Willard. The chief says his new plan of attack - is now getting a boost from a $90,000 dollar state grant. "We are going to make a drug buy off a drug dealer, and then we are going to arrest him right there on the spot," said Willard. That's the strategy for Operation Granite Hammer - targeting street-level dealers. Last week, officers arrested 14 people in one day. Thursday, Gov. 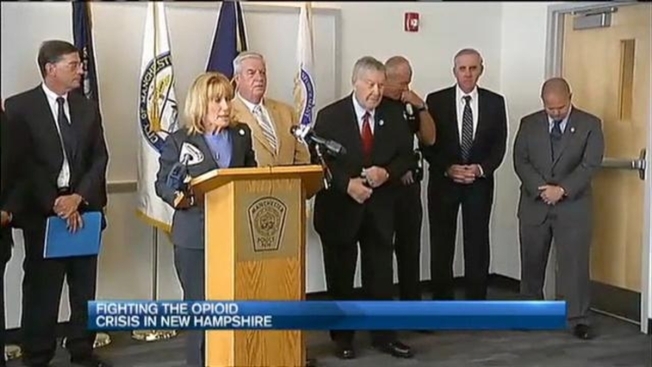 Maggie Hassan announced the state grant, which will allow more troopers to join officers on the front lines in the city. "With these funds, state police will be able to provide more than 1,200 additional hours of manpower to assist on the ground," said Gov. Hassan. A second grant of $60,000 thousand dollars will go to the state drug lab, which has been inundated with far more cases than ever before. "We have a backlog of 3,700 drug cases for analysis," said Department of Safety Commissioner John Barthelmes. The funds will allow the lab to process up to 80 more cases each month. "These dollars are coming at a critical time," said Barthelmes. It's a time in the Granite State when another fatal overdose is just a drug deal away. Attorney General Joseph Foster called Manchester the epicenter of the state's drug epidemic. That's why state police are also stepping up high-visibility patrols on the highways in and out of the city to catch drugs and the dealers before they can reach another neighborhood.